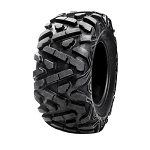 Home > ATV & UTV Tires > ATV Tires by Type > Utility Tires > GBC Afterburn Street Force ATV Tires, D.O.T. GBC Afterburn Street Force ATV Tires, D.O.T. The GBC Afterburn Street Force is a new high performance DOT approved Street ATV tire. Speed and load rated (on the sidewall) at 57N (Load rating of 57 = to 504lbs) (N speed rating = 87mph). 100% for street application. 4 ply rated for lightweight. Aggressive directional siped tread great for wet and dry traction. 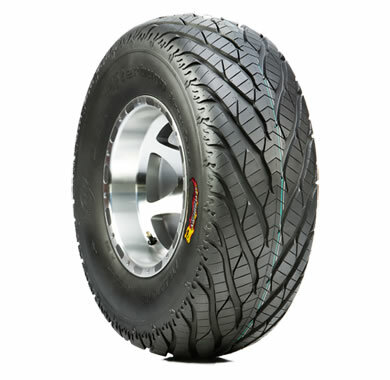 - In most cases our GBC Afterburn Street Force tires ship out within 1 business day! I looked for street tires at all the local tire stores. Some told me I would have to buy different wheels. Some told me it couldn't be done. I am so happy I found these. The person who helped me, on the live chat, had me fixed up with the correct tires in a matter of minutes. Ride great, look awesome. 100% happy with these. Our town allows street travel with side X sides. very smooth ride! Excellant quality and shipping was fast and clean, tires and rims look and work great. So happy with the tires. They are exactly what we were looking for! The price was right and free shipping was great. Super fast shipping just topped the deal!!!! We have been looking for a turf tire to go on our JD Gators and we finally found them thanks to Tommy, great wear and smooth riding. JD doesn't have a turf tire for the all of the Gators. I have purchased 4 set of this tires back in 2011 and have lasted this long. I recently just purchase one tire due to wear and a misalignment issue on my ATV but the other tires are still good as new. I ride my ATV all season from street to dirt and these tires just kills it! btw, the shipping is really fast and i'm glad I purchased my tires from this store. These tires are great! They look awesome on my rzr and make it handle like an indy car!! Great street tires for asphalt. I do a lot of miles on blacktop in the summer time. These tires don't eat themselves up like the tractor style tires do. If you spend a little time setting up your camber and alignment they don't do bad. I wish they come in a little taller size, but work good for me. most of my riding is on hard dirt surfaces and the traditional knob tire is considered a soft rubber like a snow tire which always wore out in just year. I just made my atv street legal so now i ride on asphalt roads which is extremely hard on tires. The ride is extremely smooth and the handling is more solid. This tire is like a car tire which will wear long. The price was great and the shipping was quick and free. Nice and quiet on my mule. The guys at PO were great too. They quickly sent me another set of lug nuts after the first set did not fit. Hard wearing, as required, good price, great service. Thx. There tires are really nice looking. They sure turn better on concrete and asphalt than my mud tires. I had them mounted on a set of Super Grip Blade wheels. These tires are great I love them! The shipped in like 3 days! I couldnt belive it. I Love how they look. They remind me more of bike tires then car tires. And how the tread starts to rap around to the side ending in a vary nice flame design. Everything about the tire makes the tire stand out. I love that. I bought all 4 tires for my 660 raptor. They had them in stock sizes and fit on stock rims No modification need. I got exactly what I wanted. But for me these tires deserved nice New Rims. Because they are DOT APPROVED (and yes each tire is marked with a number stating so) I will not take them off road and have yet to try them on road. But when I do, I will keep you updated. A: You could run all 4 of them the same size if that is what you want but I would recommend keeping the staggered sizes just like your stock tires. So I would get these in 25-8-12 for the front and 25-10-12 for the rear. Q: Can you tell me if the 8" version will fit on a stock, 2001 Mule 3010? I believe the 3010 stock tires are 22", but I'd love to use these 25" tires for hard surface use. Will they fit without a lift kit? A: If you have 12 inch rims on your mule then yes the 8 inch will fit the rim. I don't think these tires in a 25 inch will fit your mule if you don't have a lift kit. You might consider the Duro Scorcher, Kenda Speed Racer or the Kenda Road Go, instead as they're offered in smaller sizes. Q: how many miles can we get off this tire? Always on asphalt and 45 mils per hour? A: ATV Tires don't have any kind of mileage rating. This is one of your best options for a tire that mostly stays on asphalt. It will hold up as well or better than any other street ATV tire out there. A: Yes, you could run either size and it would work. The Afterburn is offered in 25-8-12 or 25-10-12. Either way they will be 1 inch shorter than what you currently have. The 25-8 will be 1 inch skinnier and the 25-10 will be 1 inch wider than what you currently have. Whichever you prefer will work. A: Yes you can run these if you think you have enough room for 25 inch tires. We don't have any 12 inch rims that will fit your model and these tires require a 12 inch rim. Q: hi, I have Honda trx700xx 2009, and I need to know if I can put those wheels and tires size 12 , on my atv ? thanks . A: We don't have any 12 inch rims that will fit your machine. If you have some 12 inch rims already yes you can run these tires. Q: Can I use a 14" wheel with these tires, or do I have to stay with a 12" wheel? A: These tires are currently only offered in 12 inch. You cannot use 14 inch wheels with them. Q: Is This The Only Size In 12 Inch? A: Yes, we only carry these in 25x8-12 & 25x10-12. 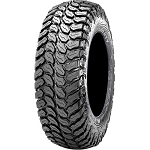 Q: I am looking for street tires for our Polaris RZR. Currently have sizes 26x12R12 in the rear and 26x9R12 on the front. Will these tires fit on our rims? A: Yes these tires in the 25-8-12 & 25-10-12 will fit your current rims. Q: I have a 2015 Sportsman 570 Touring. It appears these would be the correct sizes I need. What rim choices do you offer to match up with these and my 570? A: Any rim on our website will be available for your Polaris. Just pick out which one you like and we can put a kit together for you. Let us know! Q: I have a 2007 Artic Cat Prowler 650, I use it to plow my small driveway and for deer hunting. I have to ride paved roads leaving town and want a tire that will do it all. Off roading is limited to forest roads for the most part. Will these tires fit my machine and do the job for me? A: What are the sizes that are on your machine now? A: These tires don't come in the sizes you need to fit your stock rims. We could make these fit your machine if you bought new rims that were 12 inch. Let us know if you're interested in doing that.